Bats have suffered a serious decline due to loss of habitat, timber treatment and pest control. To help ensure the future of the species you could put up some bat boxes. If you are making your own then use rough-sawn wood so that the bats can get a grip on the various surfaces. The boxes also need to be rainproof, draught free, and the wood should be no less than 25mm thick. They can be assembled using bat-friendly waterproof glue, screws or nails. A well-built box should last about 10 years. To avoid damaging your trees when fixing the boxes, you can use headless nails or use a strap but then you will have replace the strap as the tree grows. Only steel nails should be used to attach boxes to trees as other types can poison the tree. The boxes should be sited on trees and walls as high as possible (no lower than 2 metres) and clear of any overhanging branches so that the bats have direct and easy access to them. On buildings the boxes should be placed as near to the apex as possible as bats prefer to roost at the highest point. Face the box to the south, south-west, or south-east if possible. Ideally you could put up several boxes which could face differing directions so that if one box gets too hot or cold for them the bats can move to another. Look for bat droppings or slight staining immediately below the exit hole or on the landing plate. The droppings look similar to mouse droppings but are dry and crumble to dust. The best way of assessing whether bats have moved in is to watch your boxes at dusk to see any bats leaving to feed and by looking for droppings or urine stains at the entrance. Bats may use several different roost sites throughout the year and your boxes could only end up being used for a short time, if at all. However, bats are 'ancestral' in their use of roost sites and should return for roughly the same period in following years once they have chosen a site. Of course, the more bat-friendly your local area and garden is the more bats you are likely to attract to your boxes. To see how you can improve your environment see gardening. Once or twice a year, if it is practicable, give the slotted opening a brush to remove any build up of dust, dirt or cobwebs that could block the opening. Also prune back any plants or tree branches that may have grown across. The best time to do this work is when the bats have left for their winter hibernation, which is from about late autumn to early spring. In particular avoid the period between June to mid-August when female bats are normally giving birth and lactating. Here's an interesting design adapted so that the top so that the box could be opened for inspection (if there are bats present in a bat box you need a licence from Natural England to open it). It is quite large and has a number of vertical baffles to mimic tree trunk or branch splits. Anecdotal evidence suggests it is a very successful design attracting Pipistrelles and larger bats including Barbastelles. And here's some views of the inside showing the baffle arrangement. This bat box was designed by Mick Finnemore, one of the founder members of Warwickshire Bat Group. From our experience it is a very successful design, especially liked by Pipistrelles probably due to its slim internal dimensions. Because it has such a narrow internal space it avoids the problem of birds trying to nest inside it. Download a pdf of this bat box design. This is a more recent design of box with a 'deceptively spacious interior' as estate agents would have it. The entrance is underneath the box at the back and to deter nesting birds should be no larger than 15mm. It is aimed at providing a refuge for small to medium-sized bats. Bats and their roosts are protected by law meaning that as soon as any box is being used by bats, whether they are there or not, it is protected and both the bats and the box need to be left undisturbed. So unless you have an appropriate licence from English Nature you should not inspect bat boxes where bats are known to be roosting. 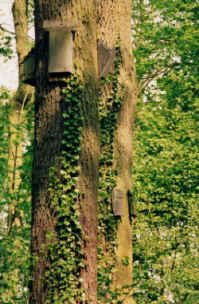 "An analysis of the usage of bat boxes in England, Wales and Ireland" by the Vincent Wildlife Trust (pdf, 1.4Mb) May 2006.